“Chirag International” is the one of the known manufacturer, supplier and exporter of a wide of Block, Brick and Allied Construction Machines. 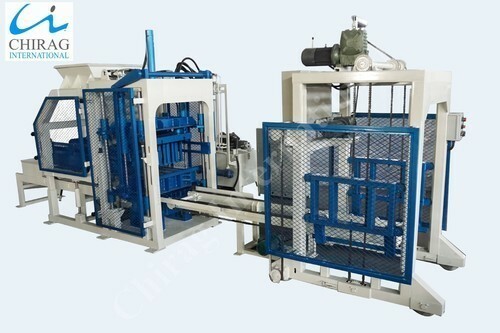 Our offered range comprises Concrete Block Making Machine , Interlocking Paver Block Machine, Brick Making Machine and Fly Ash Brick Making Machine etc.These products are designed and manufactured by our deft team of professional on the basis of Germany's machines technology, in compliance with the international quality parameters. Our CE certified range is widely acknowledged for its precise design, robust construction and durable finish standards. This offered range of our is manufactured under the supervision of our deft team of professional, who has vast knowledge of the industry. All the professionals associated with us are appointed by us on the basis of their skills, industrial experience and knowledge. Our professionals make use of qualitative raw material to manufacture this offered range sourced from the famed vendors of the market. With the aim to serve our patrons as par their exact requirements, our professionals maintain a good relationship with them to understand their need, which benefits in improvising our offered product range. With our client-centric organization, fair business dealing and ease modes of payments, we have succeed in becoming the best-selected organization of the customers from varied parts of Indian Subcontinent, Australia/NZ, Caribbean, East/Middle Africa, North Africa, South/West Africa and many more.